Protect Your Elder from a Slip and Fall Accident | Phoenix Personal Injury Law Blog - Breyer Law Offices, P.C. If you have an elderly loved one, there are many different things that you worry about when it comes to their safety. But Kingman elderly slip and fall accidents shouldn’t have to be one of them. Unfortunately, for most individuals, understanding how to protect your elderly loved ones from being injured in an accident, especially one that involves a trip or slip hazard, seems hopeless and nearly impossible. After all, you can’t be with them every second of every day to ensure that they stay on their feet, and you also can’t confine them to a chair when they are still mobile. The truth is that, although you may feel out of sorts in this area, there are many things that you can do to help protect your loved one and make it safer for them to have in-home care, for them to live in a care facility, or for them to live at home. Here are the top things that you can do to protect your loved one and make life easier and safer for everyone. Ensure proper measures are taken to provide your loved one with walkways and handrails that are appropriate for their condition. 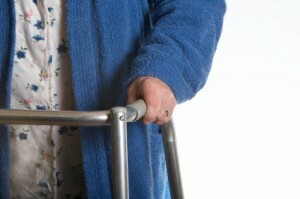 Many elderly individuals have difficulty with stairs. Installing ramps and ADA compliant handrails can help keep your loved one safe and give you one less thing to worry about all the time. Install rubberized flooring where it makes sense. If your elderly loved one currently lives in an apartment, a care facility, or their own home, chances are their space is equipped with slippery tile in the kitchen and the bathroom. Changing over to rubberized flooring works to decrease the risk of slipping and falling, even when the floors are wet. Install walk-in showers and walk-in tubs. Many individuals who are elderly have a difficult time getting over the edge of the tub or safely stepping over the edge of the shower. If your loved one is experiencing some problems talk to the care facility, or if they’re living on their own, call the insurance company, and talk about ways that you can make their bathroom safer. These are just some of the ways you can make your loved one safer all-around. Continue doing research and looking for different ways to make life easier for your loved one in everything that they do, and you’ll notice a big difference in safety along the way.